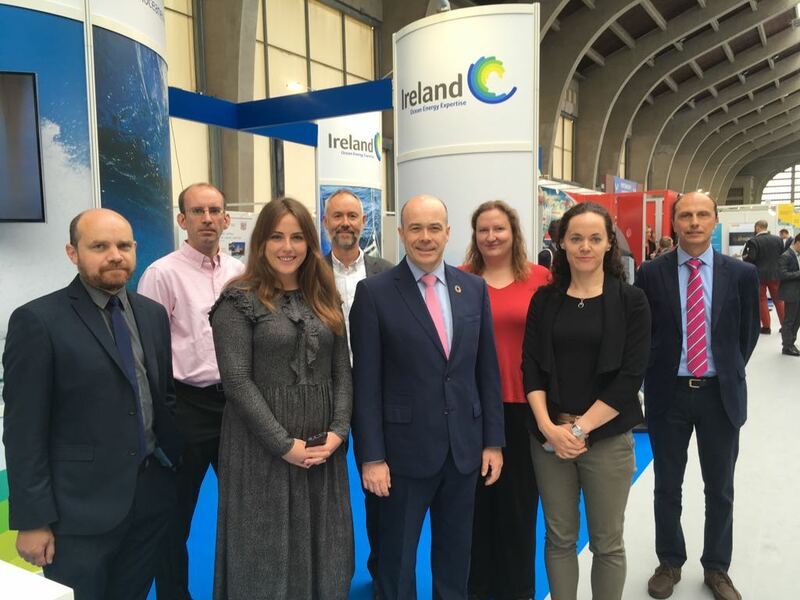 At the International Conference on Ocean Energy (ICOE) taking place in Cherbourg, Normandy this week, the Irish stand comprising of SEAI, Marine Institute, Smart Bay and MaREI staff were visited by Minister for Communications, Climate Action and the Environment, Denis Naughten T.D., this morning. After an update on SmartBay activities, MaREI’s Gerry Sutton briefed the Minister on the MaREI-coordinated MARINERG-i project which is developing a plan for an integrated European Research Infrastructure, an independent legal entity, designed to facilitate the future growth and development of the Offshore Renewable Energy sector. Minister Naughten had already highlighted the potential of ocean energy for Ireland in his keynote speech to the conference. Noting the supply chain and port opportunities associated with ocean energy for Ireland, MaREI’s Anne Marie O’Hagan talked to the Minister about the importance of integrated land and marine planning as an enabler for all Ireland’s marine sectors, a focus of the Marine Institute funded Navigate project. ICOE has been a big success with strong representation from MaREI including PhD student Celia Le Lievre presenting a poster on marine renewable energy and Natura 2000 sites; Michael O’Connor from the ORE group attending a new Interreg project meeting, Gordon Dalton presenting on the recently completed MARIBE project and Prof Tony Lewis participating in many of the conference sessions.